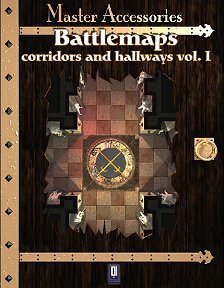 Yet another collection of lush and splendid maps, this time based on the concepts of corridors and hallways, from 0one Games. With the advent of D&D v.3.5 the emphasis on miniature use in combat has increased, and so this - along with the other map products from this company - will become of even more use: who would not prefer a full-colour detailed plan of the area in the correct scale for their figures to scribbled lines on a battlemat? Presented in the same format (and to the same high standard) as previous product in the Master Accessories series, each corridor section is provided in three formats: full colour, greyscale and line art - giving you the choice of how you wish to print it out. Corridor sections are provided as straight, T-junction, L or corners and a cross-roads junction where 4 corridors meet; and in 3 styles: dungeon corridor, a hallway filled with pillars and a hallway lined with statues. Naturally, they'll link up and - as it's a PDF product - you may print out all you need to make up the precise layout that you wish to use. There is a handy list at the back of all the other floorplans published by 0one Games, and these latest ones can be matched up with any of the others to create even more complex layouts. Even if you are not keen on using figures, these are a great aid to describing what the players see as they explore, or if you prefer, showing them what lies before them... and they even spawn ideas as you look at them. Well worth the having!